Do you dream of making money in Real Estate Investing? Turn your dreams of declaring financial independence into reality. Learn how to make the right choices, avoid the mistakes, and get your business off to a solid start! Your best exit strategies: keep it or sell it? Local instructors show you how it works, step-by-step, and right here in your own hometown. Kick-start your career! Get the boost you need to make more money, smarter and faster. Register Today - Class Size is Limited and Registration Will End When Capacity is Reached! I was able to understand how to estimate and evaluate properties which was the goal I wanted to accomplish. The Boot Camp went above and beyond my expectations! A great review as well as teaching me LOADS of new information! My confidence is higher to increase my business! An impressive amount of information and a great opportunity to get questions answered! Boot Camp exceeded my expectations! An information packed weekend to get me started at a fair price, with more confidence! I came on the recommendation of a friend and I left motivated and hungry for more! GaREIA’s Boot Camp is more beneficial then I could have imagined! It was well worth the money for the education and the contacts with both members and investors. Bus tour was SO helpful! I was exposed to different ways of making money in real estate. I also learned an awful lot from our bus tour. Hearing those varying opinions and learning how to evaluate properties on site were invaluable. The reality of what real estate investing is all about...not just pie in the sky. Thanks very much to GaREIA and all of the instructors who gave of their time! The hurdles keeping me from taking the first step was how to negotiate, how to fund the deal, and how to structure the contract. I now feel comfortable to try my first deal! I learned so much and feel comfortable that any mistake I make will be one that is not over consuming and I will still make $$$. The best program I have been to! Very diverse with different views. Excellent! Very enlightening! I learned a lot! This was an unforgettable experience. I will spread the word. Great job, GaREIA! I now feel more comfortable taking on a new property and have found new ways to structure the deal. 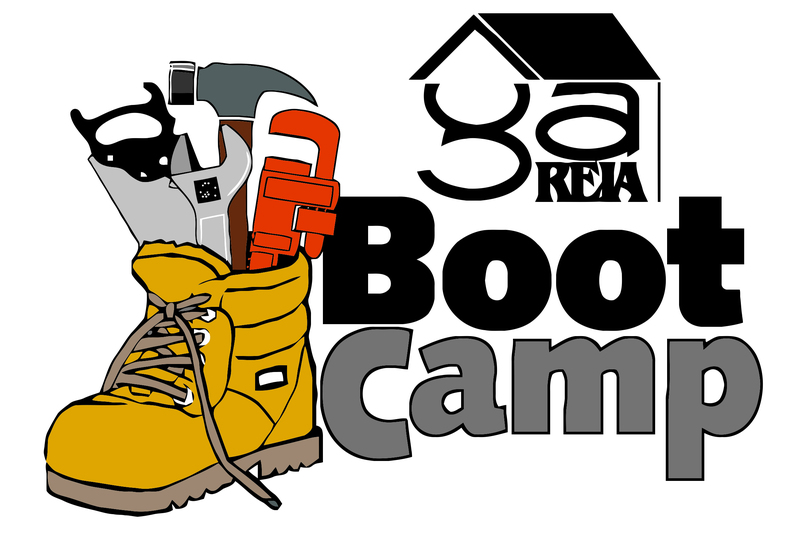 Best Boot Camp Value in the U.S.
Want to be a real estate investor? Confused by all the new terminology? Overwhelmed by all the wealth building seminars? Don’t know where to start? Continue reading to discover a foolproof way to kick-start your new investing career. If you watch late night television, you know that real estate investing is a piece of cake. Nothing to it! No money down and all the houses you can buy, right? However, once you start exploring, you discover there is a little more to it. As a matter of fact, there is a LOT more to it. The more you explore, the more confusing it becomes. Georgia REIA understands that. That’s why we designed a Real Estate Investor Boot Camp specifically for novice investors. It is a no-nonsense, three-day intensive program aimed at getting you off to a strong start, on a critical path you can trust. Experienced teachers will take you step by step through the entire process, outlining many ways you can make money, as well as ways you can seriously lose money, if you’re not careful. You’ll learn how to buy SMART by properly evaluating properties, estimating rehab work and finding the right contractors to do the work. When should you hold properties, lease/option them or sell them out right? You will gain the confidence to trust your judgment and avoid the serious pitfalls that can await you. You don't have to pay a lot for this Boot Camp! Compare the content of this program to that offered by others across the country and you’ll discover that it is just as comprehensive. You’ll learn everything you need to know without paying $3,000, $4,000 or even $6,000! This is the best kept secret in the industry! Our program is just $695 for one GaREIA member; $1,095 for two GaREIA members - with early registration - through October 10! Are you not yet a member of GaREIA? Just $895 for one person; $1,4955 for two - with early registration - through October 10! It is a bargain! But don’t confuse inexpensive with cheap. As you will see, this is not a cut-rate program. You’ll learn from local, experienced teachers—all of whom are successful investors in the Atlanta area. They will teach you what works in Georgia. How Georgia law is applied. How Georgia foreclosures work. How properties are valued right here in Georgia. You don’t have to get on an airplane and fly to California to learn how foreclosures work there and then translate them to local law and regulations. You will hear about the costs of renovation right here at home. We’ll talk about property values, foreclosure rates, appreciation rates right here in Georgia. You will be able to go out on the Monday following Boot Camp weekend and put this knowledge to work. A highlight of the Boot Camp is the Saturday bus tour of local properties, where qualified investors help you get a hands-on feel for estimating renovation costs. You’ll be given the “tools” to do your estimates. Then that night you’ll hear how the experts evaluated the various properties. You’ll learn one of the most valuable and important skills in real estate investing. This is only one of MANY lessons that will pay back your original investment in the Boot Camp, many times over. How long will it take to buy your first property? Make your next deal? If you can short-cut the process and quickly and confidently move toward a profit of $5K, $10K, $20K or—seriously—even more, isn’t that worth the registration price? Rehab Order: What’s first? What’s next? Multi-offers system / Buying Subject To: you found the deal, what do you offer the seller? Deal Structuring: There are many ways to structure deals! GaREIA put this program together in order to help new investors get started the right way. Our goal is to give you an honest appraisal of what it takes to be successful. If you want it, you can have it, by following the simple guidelines laid down in this program. Success can be yours. This Boot Camp is not a platform to sell you bigger, more expensive courses. No hard sell. No books. No tapes. No pressure. We’ll tell you about GaREIA’s other learning programs, many of which include some of the most respected national speakers, but you will not be asked to buy anything at this Boot Camp. Come and enjoy the most beneficial three days you will ever spend! Save with Early Registration through October 10! Registration Ends October 25 - Reserve Your Seat Today! Registration Ends on October 25 or When Class Capacity is Reached! Register by October 10 for Best Price!!! All sessions will be held at GaREIA Headquarters, 4353 Tilly Mill Rd, Ste 130, Atlanta GA 30360. The bus trip on Saturday will leave from and return to GaREIA Headquarters. We look forward to seeing you at the Boot Camp! Register Today! Class Size is Limited! Payment Details: Early Registration through October 10!! Register by October 10 for best price! Registration ends on October 25. Limited seating - reserve your seat today!